Today marks six months following the catastrophic landfall of Hurricane Matthew in Haiti’s southern peninsula that destroyed the infrastructure, homes, and agriculture of entire communities. The storm caused the greatest humanitarian crisis in Haiti since the 2010 earthquake. Six months after the hurricane, there are many signs of hope and progress seen in the faces of children returning to school, farmers replanting crops and fruit trees, and families repairing homes. Yet many acute needs remain, chief among them food aid and agricultural recovery assistance as families wait for seedlings to grow, rain to fall, and months to pass without the crops they previously relied on for survival. The roofs of many homes were blown away in the hurricane and are now repaired. Heartline’s Hurricane Matthew Relief and Recovery Program activities have been carried out primarily through trusted partners who were already at work in the worst affected areas prior to the hurricane, including Christian Veterinary Mission, a network of indigenous churches, and farmer cooperatives. Our partners are serving hard to reach rural mountain communities, as families living in these areas are not being reached by other aid organizations. Prior to the arrival of aid from our partners, most of the rural communities had received little to no humanitarian assistance. Your financial partnership and prayerful support have made a tremendous difference for thousands of Haitians during the critical days and months following the storm. Six months later, we have mostly transitioned from relief efforts and are now assisting hurricane victims with longer-term recovery by rebuilding homes, replanting sustainable sources of food, restocking productive animals, and reestablishing livelihoods. Wilnel Joseph and his sister, Elianie Joseph have lived their entire lives in the mountainous Duclair area outside of the seaside town Les Cayes. The only surviving members of their family, they do not remember their ages or how many years they have been farming and surviving together. But they know for sure they had never before experienced a storm with such widespread destruction as Hurricane Matthew. The storm wiped out their home, crops, and animals. “Everything was swept away off of this mountain. The only reason we are still here is because we’ve never been down off this mountain and never will. We don’t even know how to go anywhere else!” said Wilnel. This brother and sister team worked hard to build a shelter using reclaimed materials, and Heartline recently provided concrete and other materials to construct walls. To quickly replace their garden plots for personal sustenance, Wilnel and Elianie planted corn seeds, a crop that grows more rapidly than others in the region. subsistence farming, and Hurricane Matthew landed right before the harvest of staple crops in the region. Additionally, entire groves of mature fruit trees that fed families for many generations were destroyed in the storm. 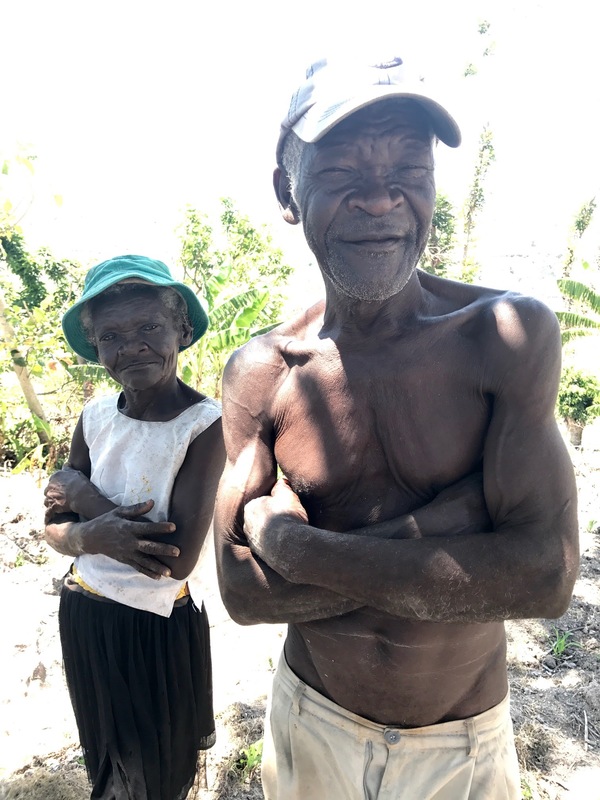 With their survival dependent on recently planted corn plants that are barely poking out of the dirt, Heartline will provide Wilnel and Elianie with additional seeds, supplemental food aid, and goats this week. Thank you for helping us reach some of the most vulnerable and impoverished survivors like Wilnel and Elianie with tangible support that communicates that we have not forgotten them and believe their lives matter. Heartline is motivated by Christian faith to provide compassionate care to some of the most vulnerable survivors, seeing the image of God in each person we have the privilege of encountering. When Wilnel and Elianie shared their overwhelming gratitude at receiving our help last week, we were quick to share that the love of God compels us and our generous supporters who made it possible. Heartline Director, Troy Livesay traveled last week to three rural communities outside of Les Cayes, a seaside town that sustained some of the worst damage. 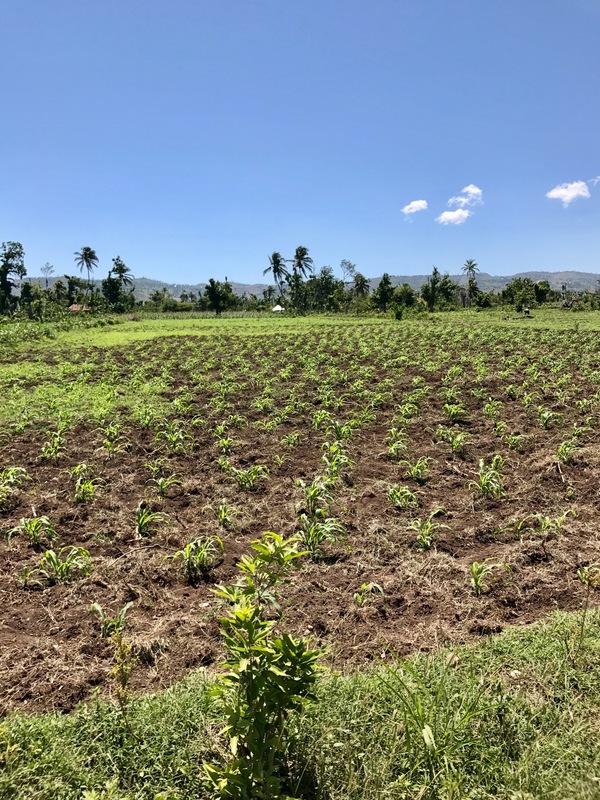 Like the majority of towns where Heartline has supported relief and recovery efforts, most Haitians living there are subsistence farmers who lost all crops and livestock in the wake of the storm. “Right now is a crucial time for relief and development work to continue in these areas. Families would ordinarily survive on previously plentiful breadfruit trees this time of year, but breadfruit groves were all wiped out in the storm, leaving families without starch crops while waiting for newly planted yam and bean crops to grow. Cases of starvation are increasing in places that formerly had had cases of malnutrition, but rarely starvation,” said Troy Livesay. Last week, Heartline funded the distribution of 1,000 roofing metal sheets to repair homes and a school in the mountainous town Briye outside Les Cayes. These and other aid distributions have taken place through an effective community-led allocation structure wherein trusted leaders have detailed records of all affected families and organize orderly relief distributions according to the greatest needs. We will return to these same communities this week to provide goats and fast growing seeds for planting ahead of the rainy season. The elementary school in Briye was badly damaged having lost its roof and walls in the storm. While school has been in session the past several months, many students have not yet returned due to the school’s missing roof which previously rendered much-needed shade. 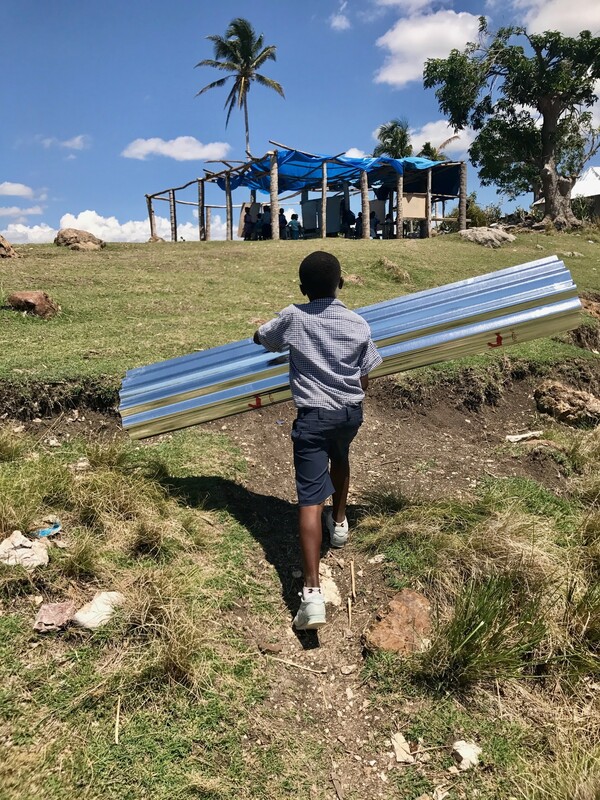 Heartline provided roofing material for the school, eagerly joined by the students in carrying the metal sheets to repair their cherished school. Thanks to your support, these beloved children, whose dreams for the future mercifully weren’t washed away in the storm, have a repaired school where they once again have the opportunity to learn and develop their God-given potential. Strengthening families is at the heart of Heartline’s mission in Haiti – a thread that weaves throughout all programs and economic development opportunities provided through employment with Heartline. A number of Heartline staff have extended families living in communities severely affected by the storm and lost their homes, crops, and livelihoods. Your support provided emergency aid to these families and, in the case of the Severe family, likely prevented impending starvation. The Severe brothers are treasured members of the Heartline staff family. 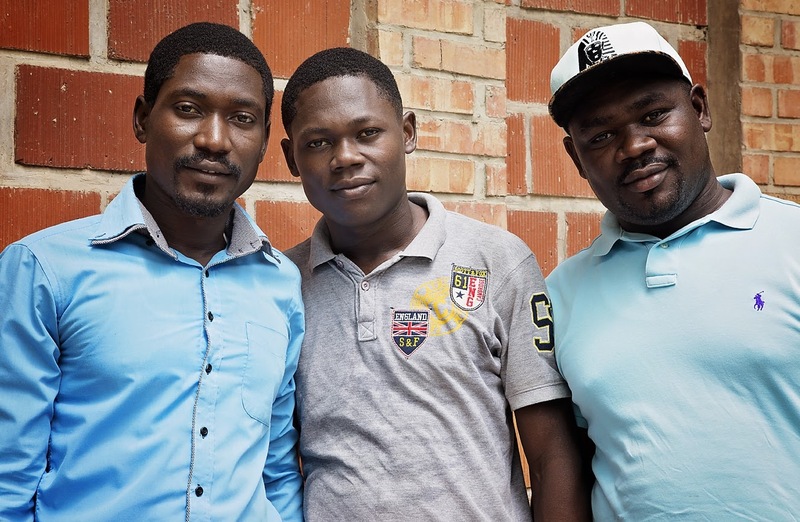 Carl works in the Beltis Bakery, Dahlens serves as a security guard at the Maternity Center, and Joubert is a core member of the Men’s Discipleship and Outreach Ministry. “We didn’t know what we could do for our family, it was difficult knowing how they were suffering while we were so far away and had no way to help them. Thank you Heartline for helping us to bring hope and help them survive,” said Joubert Severe. Thank you for standing in solidarity with Carl, Dahlens, Joubert, and the entire Severe family as they’re slowly recovering what was lost so suddenly six months ago. 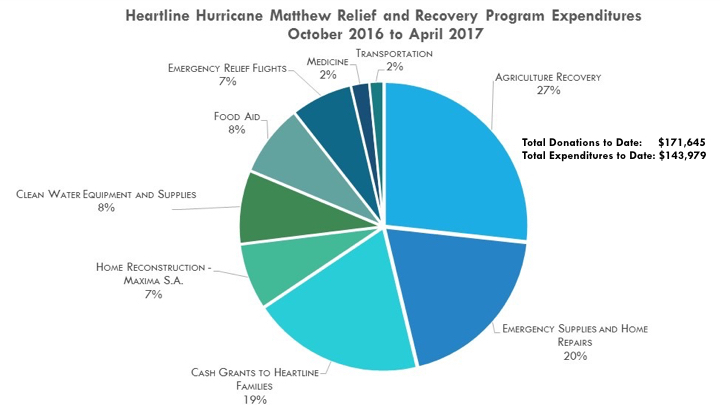 Heartline will continue providing assistance in the coming months with remaining available funds, focusing primarily on agriculture recovery, food aid, and home repairs. We long for individuals, families, and entire communities suffering as a result of Hurricane Matthew to not just survive the harrowing aftermath of the storm, but be supported in building their lives back stronger and with greater hope for the future. To make a one-time donation to support ongoing recovery and rehabilitation efforts, please visit www.heartlineministries.org/give and make a note on the donation page that your gift is for Hurricane Recovery. Your support has provided critical relief and recovery humanitarian assistance to many rural mountainous communities and across various support sectors to holistically aid some of the most vulnerable hurricane survivors. Emergency Relief Flights – Heartline funded five large Mission Aviation Fellowship aircrafts filled with food, water purification kits, tarps and other temporary shelter materials, and other relief supplies to reach hard hit communities unreached by large aid organizations. Food Aid – Emergency food aid was provided for communities at risk of malnutrition and starvation as a result of complete crop destruction. The majority of food aid distributed consists of staple rice, beans, and oil. Emergency Supplies and Home Repairs – Temporary shelter and home reconstruction materials have been critical needs throughout the response. Heartline has funded the distribution of many thousands of tarps and tin sheeting for families whose roofs were destroyed and were living out in the open. Other building materials have included cement, wood, and nails. Several schools and churches have also been rebuilt as a result of these distributions. Clean Water Equipment and Supplies – Heartline funded the installation of disinfecting bleach-making machines in two cholera clinics and WaterStep water treatment solutions in four communities, as well as the distribution of aquatab water purification tablets, buckets, and water filters. Agricultural Recovery – Christian Veterinary Mission has been Heartline’s primary partner in the relief and recovery program. Through CVM’s crucial intervention in rural communities, hundreds of subsistence farming families have received seeds with short growing seasons and fruit trees to replace lost staple foods with high nutritional content. Thousands of livestock such as goats and chickens have also been distributed to replace lost productive animals depended upon for subsistence. Cash Grants to Heartline Families – Heartline provided direct assistance to support the families of Heartline employees who lost homes, crops, and livelihoods. These cash grants funded the purchase of home repair supplies, food, medicine and other medical assistance, and agricultural recovery. Home Construction with Maxima S.A. – Heartline and Maxima formed the “Haiti Housing Fund” partnership to rebuild homes using anti-seismic and hurricane resistant housing kits to help victims build back better. Medicine – Heartline funded the delivery of lifesaving medicine through airdrops to unreached rural communities during the initial relief phase. Antibiotics and first aid materials have also been supplied to communities lacking critical healthcare supplies. Transportation – These costs include fuel for vehicles carrying supplies, rental of several vehicles, and driver staffing costs.